As I typed that I caught myself saying riz-auto in my head like I'm Chef Ramsey. Have you ever heard him say it? It's just like that. Anyway, one of my favorite not so healthy indulgences is risotto. I've never had it at a restaurant so I have no comparison as to what it "should" taste like. But, I've made it countless times at home and love it. Here's the recipe I use as a base - not surprisingly from Martha. I get the sliced baby portobellos from the store to help with the prep work because risotto is a dish of love and labor. It's not one that you can start and walk away from. I've never timed it, but I think it takes about 30 - 40 minutes of constant stirring. Not a side I make if the husband has to work late. It's also a great recipe to use any frozen, homemade chicken broth because it calls for like 5-6 cups of chicken broth. 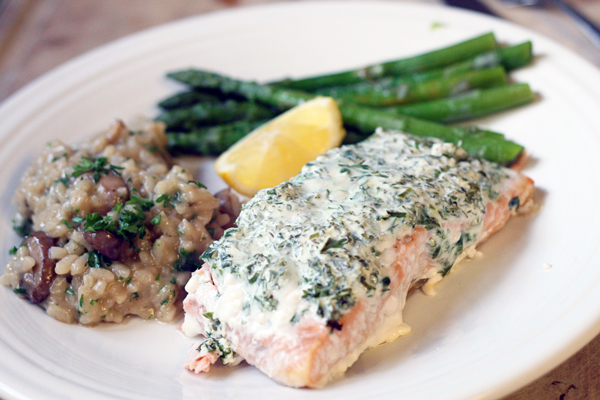 Since the risotto needed serious attention, I baked some salmon and steamed some asparagus to have with it (it also balanced out the meal to be a little healthier). Although, I could eat of bowl of just mushroom risotto by itself. And that's what we had the other night. It's supposed to be a quick version that you can bake! 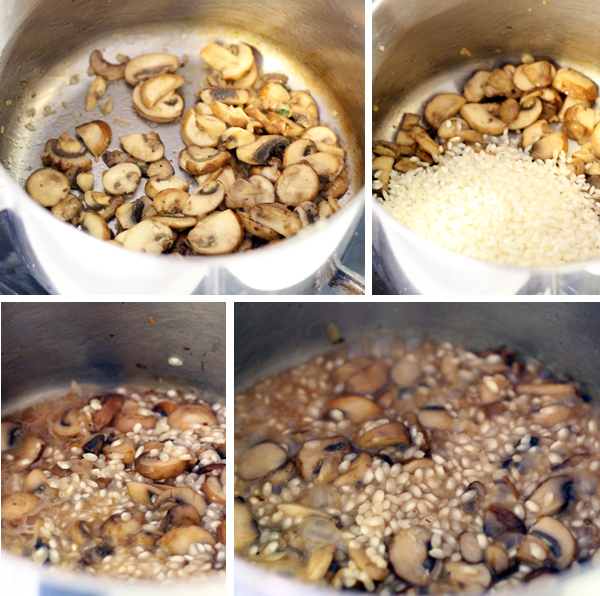 40 minutes stirring mushrooms!!!! Yeah, that is never happening here, we'll come eat yours anytime. Wow 40 minutes.